Agro Culture LIQUID Fertilizers is one of America’s fastest-growing agricultural companies. In 2012 it issued an RFP for Design/Build services, capturing the attention of firms across the state of Michigan. Eight D/B firms competed for the right to construct the facility, but the Wieland/Hobbs + Black team won the day and commenced design. After a 14-month construction period, Wieland met the deadline for an August 2013 grand opening. The impressive, 60,000 SF facility is a homage to the future of farming, as well as the past. From one side the structure resembles a classic barn; from another side, it resembles a modern office building with a glass silo. Inside the facility timber, polished concrete and vaulted ceilings create a stunning aesthetic effect. 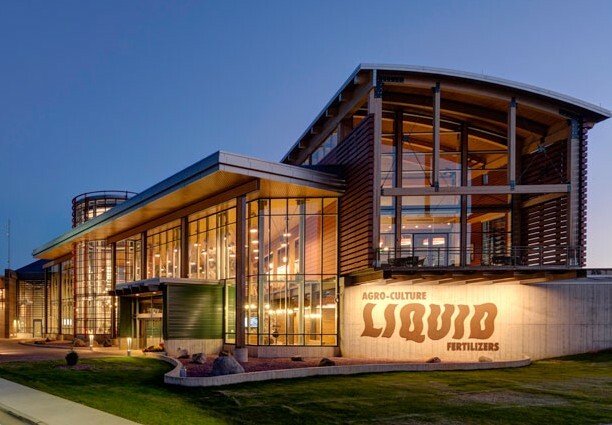 In 2014, the Construction Association of Michigan (CAM) named the Agro Liquid project its 2014 Project of the Year.